During our anti-American resistance war for national salvation, Military Region 4 was at the forefront of socialist North Vietnam, the direct rear of the great front line in South Vietnam and the fiercest battlefield across the country. During the 1968 General Offensive and Uprising (also known as the Tet Offensive), the people and soldiers of Trị - Thiên - Huế seized control of Hue City and many towns for a while. Promoting this spirit, Military Region 4’s armed forces are stepping up the building of strong all-people national defense and of people’s armed forces characterized by a high degree of fighting power and successful fulfilment of assigned tasks. Pursuing the Party’s strategy and the higher echelons’ operational plan, on the eve of 1968 Lunar New Year, the people and soldiers of Trị - Thiên - Huế mounted offensives and uprisings en masse against hostile prime targets with cities and towns as the focal point, much to the enemy’s astonishment, achieving resounding victory. On the very first day, they assaulted over 40 targets inside and outside Hue City, 34 towns and districts, smashing much of the hostile apparatus, liberating 227,000 residents, 40 communes and 296 hamlets, seizing control of Hue City for 25 days and nights. The Revolutionary People’s Committee and Alliance of National Democratic and Peaceful Forces of Vietnam were established in Hue City and a number of districts. During the 1968 General Offensive and Uprising, the people and soldiers of Trị - Thiên - Huế eliminated over 200,000 hostile troops, shot down over 200 warplanes, broke down 400 military vehicles, 48 ships/ boats, 13 ammunition depots, 70 cannons of different kinds and 30 bridges, and terrorized 34 military posts into surrender and retreat. 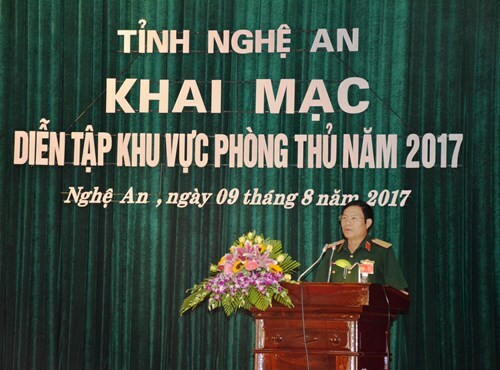 The Central Office for South Vietnam and the National Front for the Liberation of South Vietnam (also known as the National Liberation Front) conferred 4 golden words “offensive, uprising, heroism, resilience” on the people and soldiers of Trị - Thiên - Huế in recognition of their outstanding achievements during the 1968 General Offensive and Uprising. 50 years have elapsed, yet echoes of the 1968 General Offensive and Uprising as well as heroism and the spirit of “determination to fight, determination to win” by the people and soldiers of Trị - Thiên - Huế, continue to reverberate. Those represent not only the pride of but also responsibility by the people and soldiers of Military Region 4 in the cause of today’s Fatherland building and safeguarding. Inheriting and perpetuating the spirit of the 1968 General Offensive and Uprising in the new situation, Military Region 4’s armed forces commit themselves to be absolutely loyal to the Fatherland, the Party and the people, ready to undertake and successfully fulfil every assigned task, contributing to firmly protecting the socialist Vietnamese Fatherland. To this end, the following is a to-do list. First, thoroughly grasping and strictly observing the Party’s military-defense guidelines while regularly researching and properly assessing situations so as not to be pushed into passivity in any circumstances. During the 1968 General Offensive and Uprising, the High Command of Military Region Trị - Thiên - Huế thoroughly grasped guidelines by the Politburo and the General Headquarters of the Vietnam People’s Army by extensively researching the situation to provide proper assessment, including the enemy’s weaknesses and strengths and our capabilities. This could be evidenced by taking Hue City as the prime direction and target and 2:33 a.m. on January 31st, 1968 (or the eve of the Lunar New Year) as the timing of offensives, catching the enemy off guard. Currently, amidst complicated, unpredictable developments in the region and the world as well as hostile forces’ intense sabotage activities, it is essential that Military Region 4’s armed forces thoroughly grasp the Party’s guidelines on Fatherland safeguarding. Being fully aware of this, over the past time, Military Region 4 has thoroughly grasped the Party’s resolutions and directives, especially the Resolution of the 12th Party National Congress, the Resolution of the 11th Party Central Committee’s 8th plenum on the “Strategy for Fatherland protection in the new situation”. This has laid a foundation for the Party’s resolutions and directives to be concretized into plans in accordance with Military Region 4’s capabilities and assigned tasks, with operational plans, Plan for building the armed forces, Master Plan for combining national defense with economic development in Military Region 4 until 2020 and beyond, to name but a few. Simultaneously, Military Region 4’s armed forces have closely cooperated with local authorities and other friendly forces, especially the forces of Public Security and Border Guard, in raising the quality of situational predictions, formulating and executing plans for pre-empting riots/terrorists attacks and protecting strategic targets, mounting joint clean-up campaigns along the border and so on, contributing to preserving political security, social order and safety, firmly protecting independence, sovereignty, unity and territorial integrity. Second, stepping up the building of all-people national defense, the posture of all-people national defense associated with that of people’s security. The fact that the people and soldiers of Military Region Trị - Thiên - Huế mounted offensives and uprisings en masse in three strategic regions with Hue City as the focal point came as the greatest surprise to the enemy during the 1968 General Offensive and Uprising. Offensives by regular troops were closely combined with uprisings by the masses with local armed forces as the core. Owing to such a close combination and the promotion of synergy from people’s war, our regular troops managed to assault the very heart of Hue City after having secretly reached the gateway, which had a seismic impact on the enemy. Drawing lessons from that first-hand experience, Military Region 4’s armed forces have actively counselled local authorities to lead and direct the building of strong defensive areas consonant with localities’ capabilities. Importance has been attached to socio-economic development associated with defense-security enhancement, building the posture of all-people national defense associated with that of people’s security, building the “posture of people’s hearts and minds”, planning and gradually building military posture in defensive areas, especially strategic regions, border/coastal areas, and so on. So far, key coastal areas of Military Region 4 have witnessed the mushrooming of export processing zones and industrial parks associated with new urban areas. Against this backdrop, to ensure the combination of socio-economic development associated with defense-security enhancement, the Party Committee of Military Region 4’s High Command (hereinafter Party Committee) has directed the lower echelons to counsel provincial people’s committees to revise regulations/mechanisms on the building and organization of defensive areas, to accelerate action programs to implement the Politburo’s Resolution 28-NQ/TW and the Government’s Decree 152/2007/NĐ-CP. Military Region 4’s military agencies have also been directed to cooperate with local authorities in reviewing and revising Master Plan for combining national defense with economic development until 2020 in accordance with realities, to promote their role and sense of responsibility in appraising and commenting socio-economic development projects, especially foreign-invested projects and projects concerning regions which are key to defense and security. At the same time, State management over national defense has been increasingly enhanced while resources have been mobilized to build defensive works in line with a designated road map. Third, ceaselessly developing fighting power of Military Region 4’s armed forces. The victory of the 1968 General Offensive and Uprising was derived from multiple factors, one of which was that the people’s armed forces successfully fulfilled their role as the core of people’s war, especially at the onset. In order to meet the requirements of Fatherland protection in the new situation, the Party Committee has concentrated on making the three-category armed forces strong politically, ideologically, organizationally with a high degree of combat readiness. It has paid attention to making its affiliates politically strong and to heightening awareness, sense of responsibility and political, revolutionary zeal among the armed forces whereby they commit themselves to be absolutely loyal to the Party, the State and the people, ready to undertake and successfully fulfil every assigned task. To make sure that Military Region 4’s armed forces become “compact, strong, balanced, synchronous”, importance has been attached to organization, training and discipline with priority assigned to the improved quality of training pursuant to Resolution 765-NQ/QUTW by the Central Military Commission. Inferior units have firmly stuck to the motto of “basics, practicalities, thorough grasp” with great importance being attached to the synchronized and in-depth training. The Party Committee has directed its affiliates to be on a 24-hour standby for combat readiness while regularly reviewing, revising and implementing operational plans and plans for disaster relief, search and rescue close to realities. It has also devoted due attention to the building, management and combat readiness training of the reserve so that they can be on a 24-hour standby. Meanwhile, importance has been attached to making the militia and self-defense forces “powerful and widespread” with balanced organizational structure for them to be infused with political zeal and eligible for being at the core of preserving political security and social order and safety in localities, especially in strategic regions. Promoting the spirit of the 1968 General Offensive and Uprising, against all the odds, Military Region 4’s armed forces continue to exert themselves and cooperate with local authorities and locals in stepping up the building of all-people national defense and the building of the posture of all-people national defense associated with that of people’s security, thereby contributing to firmly protecting the socialist Vietnamese Fatherland.